Open the peach tin and separate the liquid and the peaches. Except for 4 – 5 peaches cut the rest into small pieces. Cut cashewnut (kaju) in samll pieces. Mix fine wheat flour (maida) with baking powder. In a bowl mix butter and condensed milk..
Now little by little add the fine wheat flour (maida) and baking powder mixture. After it is properly mixed add vanilla essence. Mix 1/2 cup of hot water in the mixture and whisk nicely. Now apply a layer of butter to a tin. Pour the mixture in the tin. Preheat the oven for 10 minutes. Now keep the tin with the mixture in the oven for 30 minutes at 400 F.
Prick the cake to see if the cake is ready. If it is done take it out and let it cool. Now whisk the fresh cream. 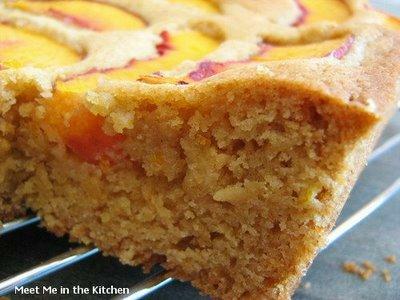 When the cake cools doen pour some of the liquid from the peach tin. When the cake absorbs all the liquid pour some more to make it a bit soft. Now cut the cake from the center into 2 halves. On the lower half apply half the beaten cream. Sprinkle some cut peach pieces and the cashew nuts. Apply jam on the outer section of the whole cake. Apply rest of the cream on the top of the cake. And sprinkle rest of the cashewnut (kaju) and peach pieces.